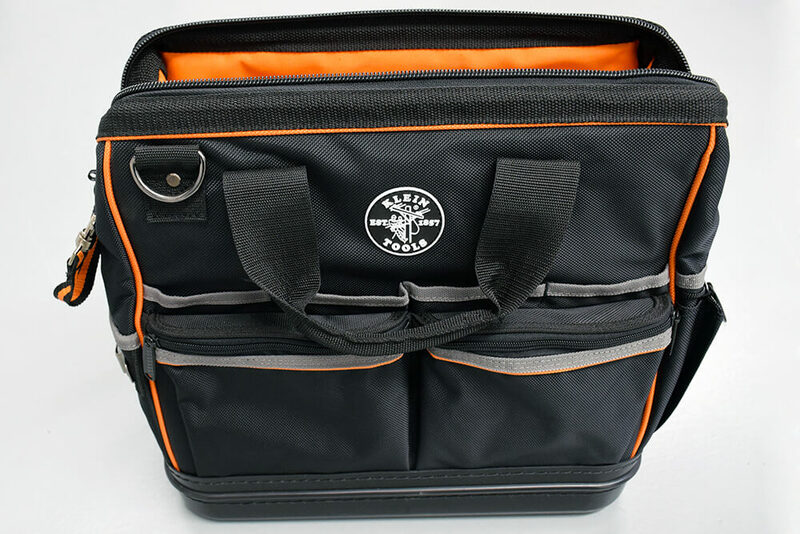 Secure, large tool bag with a variety of 31 storage pouches for tools and documents. Hard, waterproof base to keep tools dry. Heavily padded strap and padlock facility on zip. Versatile removable LED light with magnet to stick to consumer unit or turned around to illuminate inside of the bag. 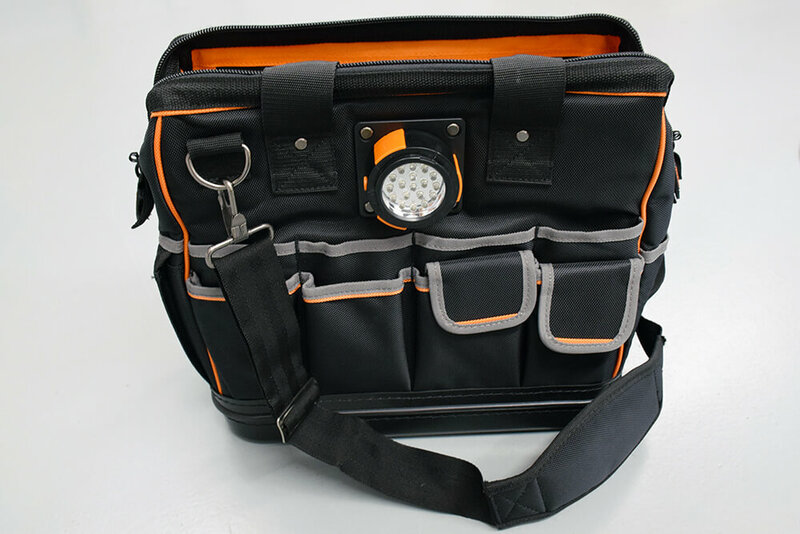 With long days on site and a different job every day, tradespeople need an organised tool bag that is large enough to carry all of their essential tools. Klein has designed just that, with a few little extra features to make this a practical one site tool bag. Within the bag, there is plenty of space to store not only your tools, but a large pouch specifically for documents and certificates, to keep them flat. 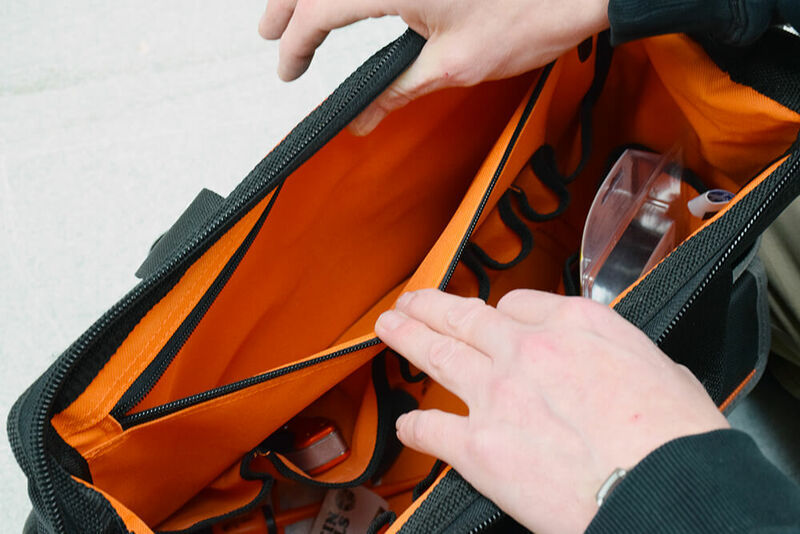 There are a variety of pouches inside the bag and outside, with side pouches ideal for smaller items like wago connectors, tapes, or other accessories. 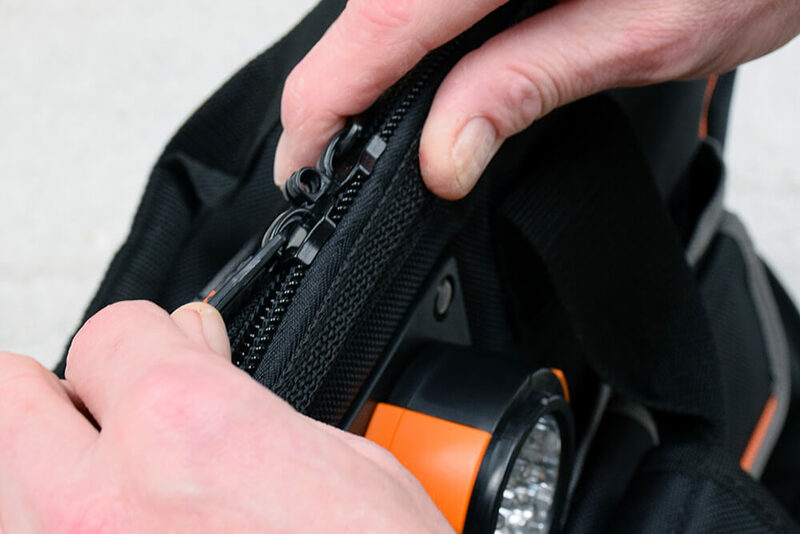 The handles come with a fully adjustable Velcro strap to keep everything together, with the bag also featuring good double zips and a padlock facility. The only drawback with the tool bag is that many of the exterior pouches are small. An improvement could be to have more of the larger pouches, or smaller pouches on one side and larger on the other side. 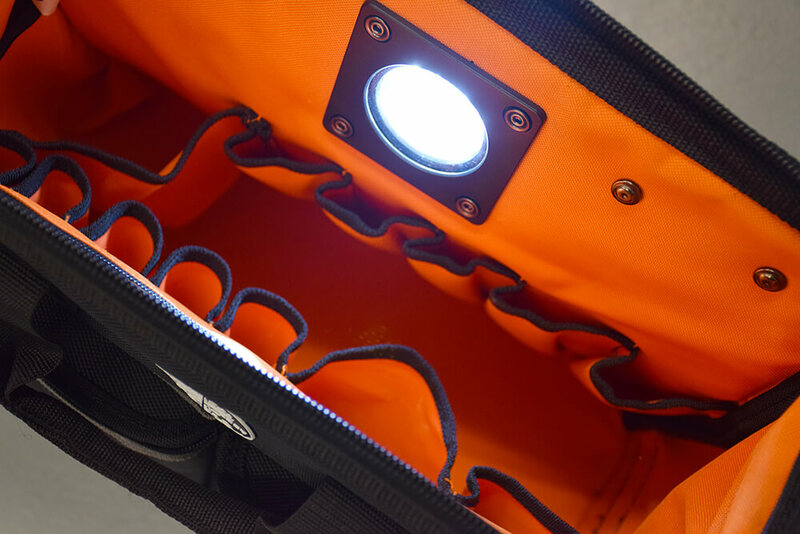 The bag also has a hard, waterproof base, which is a great addition and a bonus for tools as it will keep them dry. Great value for money and holds a multitude of purposes. Sturdy, comfortable shoulder strap. Heavy padding to make it perfect for carrying heavy objects around. 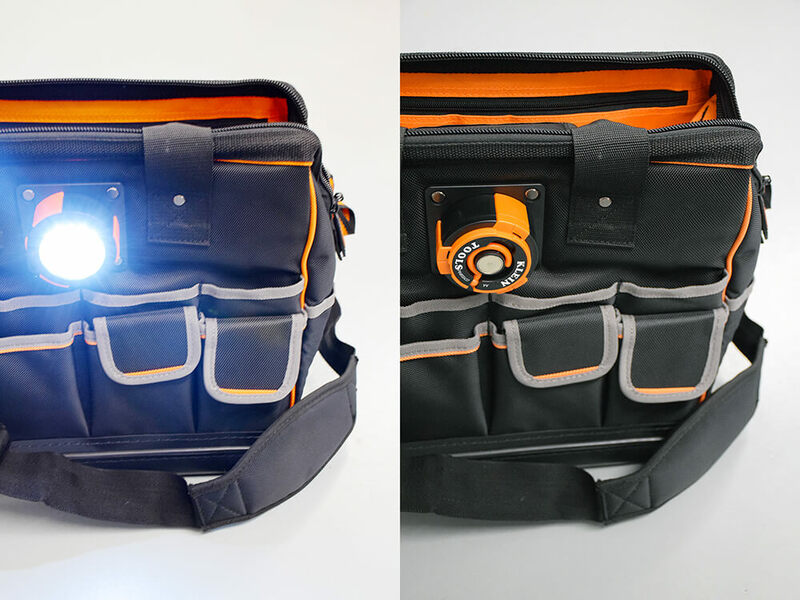 Magnetic, reversible torch is a great addition to this bag that can be used 4 ways: facing outwards on bag, facing inwards to light up bag, hung while on site and used as a magnet. The large internal flat pocket for certificates and documents, to help keep them flat, is a great feature! Lack of big pouches and too many small pouches outside. Klein Tools’ Tradesman Pro Organiser Tool Bag is available to buy from CEF for £80 +VAT. Looking for some Klein tools to fit in your new tool bag? Take a look at our Klein Tools VDE Insulated Screwdriver Set review!